I’ve seen many good looking electronics projects in my time, but few of them can compare with the simplicity, style, and elegance of the build that I am about to show you. 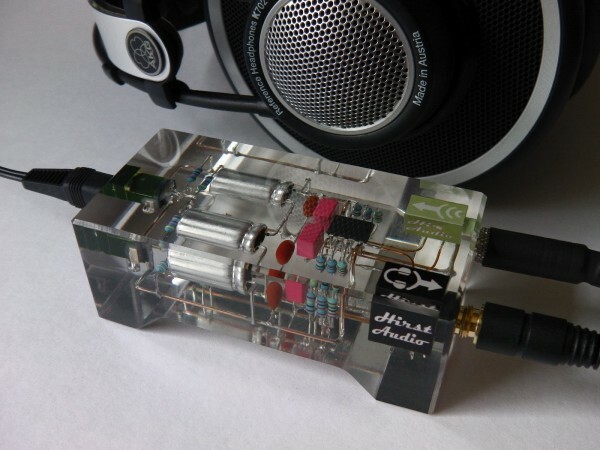 Rupert Hirst, who runs an electronics hobby blog called Runaway Brainz, is either a very dedicated audiophile or just has a lot of time on his hands. 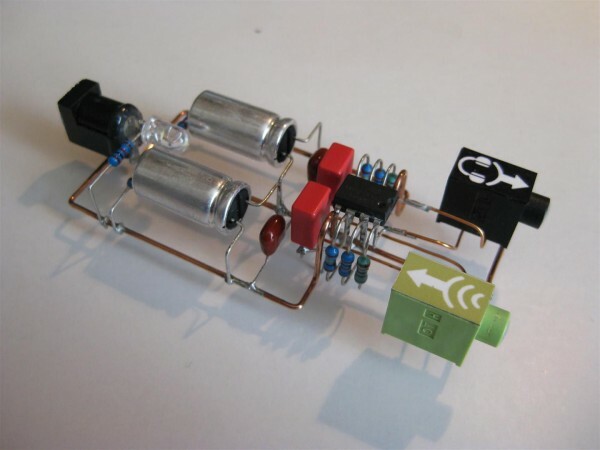 He has built himself a very impressive little headphone amplifier. What you see here is the circuit that comprises his amp. The twist here is that he avoided connecting his components by traditional means using a perforated board or custom printed-circuit board. Instead, as you can see, he made his connections by soldering components directly together. He gave the entire thing some support (and common wiring) by bending lengths of thick copper wire and soldering it where needed. He added an bright-white LED for some accent lighting and attached his input/output jacks and that’s pretty much it for the build. On its own this build looks simple and attractive with its rounded bends and exposed components but it has a very real problem; the circuit is very fragile in this state and would be prone to short circuiting. 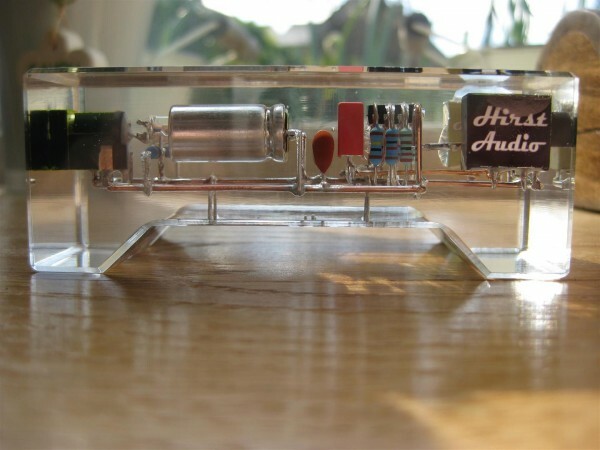 Now Rupert could have just installed his amp in a project enclosure, even a nice transparent one would do. But, Rupert decided to go with something a bit more involved and certainly more rewarding. Rupert chose to encase his beautiful circuit in clear resin. This would provide structural integrity, insulation, and would allow him to showcase the build in a really interesting way. 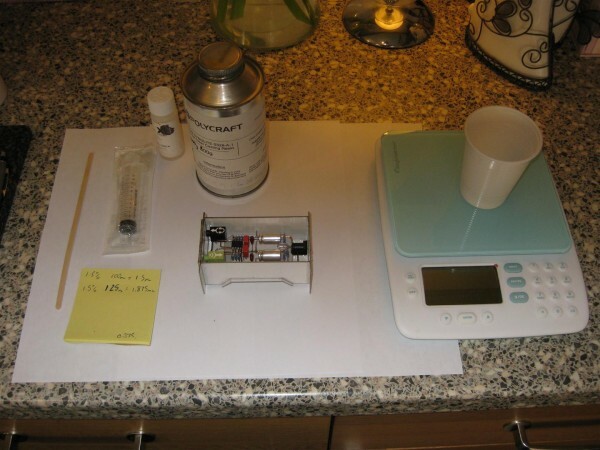 He had some concerns that the exothermic chemical reaction started by the catalyst used to set the resin might do some damage to the capacitors used in the circuit so he made note of their operating temperature and monitored the reaction closely with a thermometer. Once his resin case was hardened sufficiently he spent a bit of time with a belt sander to smooth out the casing and polished it with Brasso. What he ended up with was the work of art that you see below. I think that this work clearly speaks for itself, I don’t have anything other to say than “wow”. If you’ve got thoughts on this project or have other projects that you think we should see please leave us a comment below! That is definitely some artistic electronic construction. It looks good potted up in that clear resin. Not the most efficient use of space, and probably on the heavy side with all that plastic. Still, if you are going for looks and don’t care about portability or serviceability, that’s a really nice little 100 milliwatt stereo amp. That is nice well done that man.